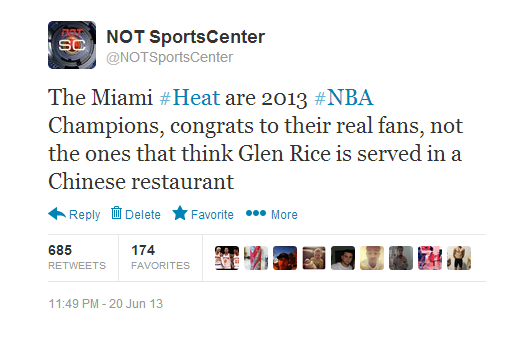 These tweets were in response to @NOTSportsCenter tweets on Friday, May 24. We’re like part national enquirer/part onion/part sportscenter from 10 years ago/part alcohol. Emphasis on the alcohol. Hater, Lame, and swear words are about the extent of a Heat fan’s vocabulary. Try opening a dictionary. 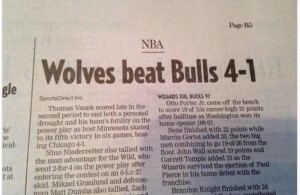 Oh…that would require being able to read. Sorry. Lance Stephenson’s head got in the way of Dwyane Wade’s elbow late in Game 2. Nothing was called. We said if you flipped those there would be 23 flagrants called. Wade just barely missed our all-whining team that we tweeted the other day but there was nowhere to put him with LeBron and Kobe starting. Uh…sure? But that’s impossible anyway, that would require being able to whine 25 hours a day. Wade had a play where he basically tried to sell that he got knocked from the 3 point line to the baseline. But sure, “no flopping.” Riiiiiiiiiiiiight. HOLY HELL NO WAY. THAT CAN’T BE TRUE. NO. SHUT UP. YOU MUST BE LYING. WOW. TOO WILD. Yeah, TheNBAonNOTSC goes way back with Michael Jordan…we asked him how to respond to this. He said to say “Yours A Idiot.” Oh that Jordan…he’s too funny.